View More In Document Cameras. LV-7000 features a high definition image sensor, ensuring high-quality and clear images; Progressive Scan in real-time; Immediately captures pictures or records of student presentations.Excellent picture clarity, high-quality color, and good refresh rate for a dynamic demonstration.It is essential for multimedia presentations, teaching and the training to a larger audience. Versatile Digital Functions: image split, shift, freeze & rotate. Multiple input/output, it's able to connect projector directly, easy to use;With innovative teaching tools, advanced connectivity, and durable design, it's an ideal fit in any classroom. Along with XGA, SXGA, WXGA 720p HDI1080P high resolution; Supports 16:9 display Multiple Resolutions. The Focus/Iris/White Balance are automatically adjusted. These functions can also be adjusted manually to best-fit your needs. Fast Auto-Focus: Images will be auto-focused in only 1~2 seconds. 22x optical camera zoom enlarge the shooting zone. Image Freeze Make the images become still on the screen. Multi-Scene Display The multi-scene feature allows multiple images to be shown at the same time. Excellent picture clarity, high quality color, and good refresh rate for a dynamic demonstrations.It is essential for multimedia presentations,teaching and the trainning to a larger audience;Features a high definition image sensor,ensuring high-quality and clear images;Progressive Scan in real-time;Immediately captures pictures or records of student presentations. ALL-IN-ONE:This document camera has camera, image system process (ISP) and power all in one. It can be used to display a wide range of materials by connecting to a proper display device. 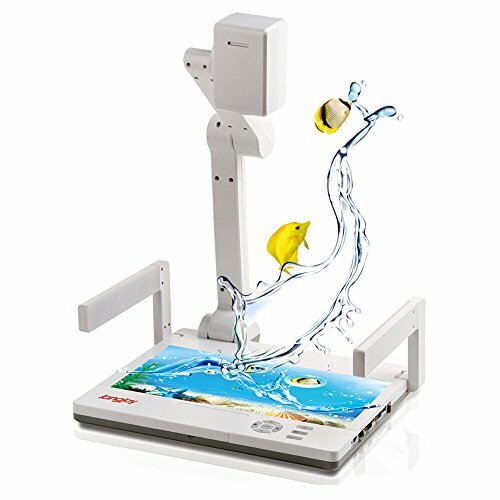 It's a digital device for displaying objects, text, charts, slides and transparencies.also can display film, objects and a wide range of other materials in fined details. It can be connected to a lot of devices such as TV, projector and computer for displaying images. Versatile Digital Functions: image split, shift, freeze & rotate. Multiple input/output,it's able to connect projector directly,easy to use;With innovative teaching tools, advanced connectivity, and durable design, it's an ideal fit in any classroom. If you have any questions about this product by Longjoy, contact us by completing and submitting the form below. If you are looking for a specif part number, please include it with your message.